This article penned by me was published in the Open Page of The Hindu daily dated 17-Aug-2014. The verdict on a Public Interest Litigation petition that the Supreme Court of India gave, disallowing a stay on the release of the Aamir Khan film PK, is indeed a landmark in more ways than one. The Supreme Court even went to the extent of stating: “If you don’t like then don’t watch the film, but don’t bring religious facets in it.” The Chief Justice of India said: “What will you hide in the age of Internet? Today’s youth is very smart.” Now that’s quite something. Along with the remarkable social progress India has made over the years, there has been a distressing increase in religious sentimentalism. People started to condemn freedom of expression, taking the stand that it would do ‘harm to their beliefs’. This attitude has indeed hit many artistic works of artists themselves. But this verdict by the Supreme Court has rectified it all. This should be a message to everyone who believes that their ‘beliefs’ are above others’ freedom of expression. 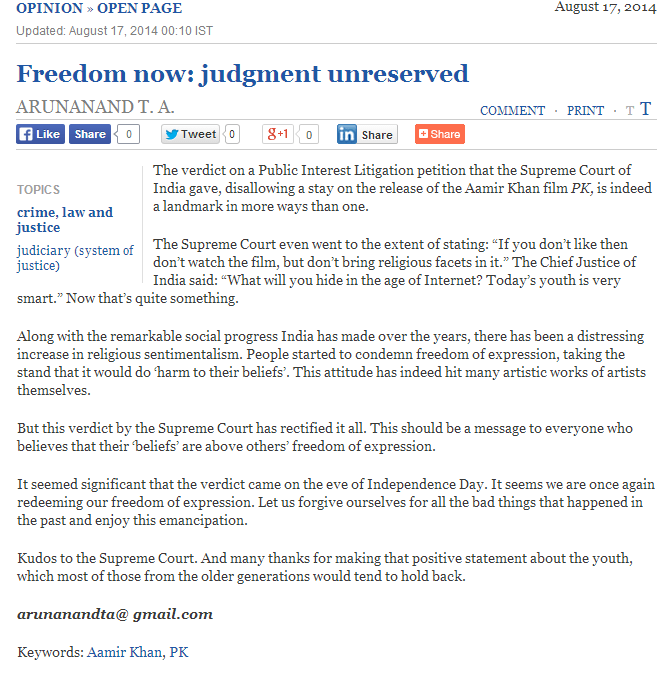 It seemed significant that the verdict came on the eve of Independence Day. It seems we are once again redeeming our freedom of expression. Let us forgive ourselves for all the bad things that happened in the past and enjoy this emancipation. Kudos to the Supreme Court. And many thanks for making that positive statement about the youth, which most of those from the older generations would tend to hold back. ← The School I want my kids to study at!